COMMENT: We’ve covered  the neo-Nazi  group The National Socialist Underground and its links  to German intelligence  for months. One of the most significant aspects of the case is the fact that powerful elements within the German government  are going to extraordinary lengths to eclipse the institutional connections of the group. Turkish media  were excluded from being seated at the trial of the group , many of whose victims were Turks. In addition, leading German media  were left out of a “raffle” to award seating at the trial. For more than a decade, we’ve examined the 9/11 attacks, the Nazi and fascist  connections to that attack, in particular. In our visits with Daniel Hopsicker , we have noted that Mohamed Atta was fraternizing with Germans  and Austrians in South Florida , having been brought into the United States  (from Germany) by the Carl Duisberg Society . Now, Germany Watch has published an intriguing hypothesis concerning the murders committed by the group and the 9/11 attacks. 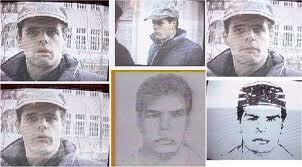 Andreas Strassmeier and composite sketch of "John Doe #2" in the Oklahoma City bombing. Against the background  of German intelligence  connections to the 9/11 attacks, the story below notes that murders 2, 3 and 4 occurred in the immediate run-up to 9/11, the fourth less than two weeks before. The National Socialist Union then disappeared from public view for two years. The presence of a German intelligence officer at the scene of one of the murders (who possessed Third Reich documents as well as other Nazi paraphernalia) also is worth noting, as is the useful “amnesia” (mind control?) of one of the German police officers shot by the group. Of course there are other possibilities for the duplicity on the part of the authorities, however the working hypothesis presented by the Germany Watch folks is more than a little intriguing. Pan Am Flight 103 bombing: The "operational template" for the 9/11 attacks? The supposedly “modern,” “democratic” government of Mr. Erdogan in Turkey  is neither , having evolved from the Al-Taqwa milieu, inextricably linked with the Muslim Brotherhood, the Underground Reich and 9/11. The Turkish nationality of many of the victims (including those killed in the run-up to 9/11) would, therefore, not exclude the possibility of links with Atta and company. The Atta milieu was inextricably-linked with “protected” drug-trafficking networks. In FTR #’s 498 & 499 , we examined the links of SICO to 9/11, which are fundamental. In this context, we note that as discussed in FTR #’s 498 & 499 , SICO’s aviation subsidiary trained its pilots at the same airport served by Rudi Dekkers’ crew–the same drug-smuggling nexus through which Mohamed Atta and his German associates infiltrated the U.S.
Becker’s murder also brings to mind a “back story” about the 9/11 attacks and the bombing of Pan Am 102 over Lockerbie. In AFA #35 , we analyzed the Pan Am 103 bombing, its links to the Iran-Contra affair and complicity on the part of elements of the Reagan and George H.W. Bush administrations, as well as their associated intelligence officers. The hypothesis presented there is a complex one and the program was recorded incrementally before the internet age. Listeners should be aware that it is a long, detailed analysis. Returning to the subject of Pan Am 103, we noted in our analysis that the planners of the bombing utilized one of U.S. intelligence’s controlled drug networks, knowing that such a network might be an excellent way of bringing the bomb safely aboard the aircraft. We have come to believe that the Pan Am 103 bombing may very well have been the “operational template” for the 9/11 attacks. The 9/11 attackers were able to utilize one of this country’s intelligence-sponsored drug importation networks to mask their activities. Did the planers of the attack reference the Pan Am 103 bombing in this context? In that same context, Robert Mueller also proved “less than vigorous” in his pursuit of the Pan Am 103 investigation. Did his performance in that case also “assist” in his appointment? We note in closing that there is a German link to most of this country’s recent terrorist incidents: the first World Trade Center attack (the financing came from German accounts); the Oklahoma City bombing (McVeigh/Nichols’ mentor appears to have been Andreas Strassmeir, son of Helmut Kohl’s chief of staff and grandson of one of the founders of the NSDAP under Hitler. Check out the resemblance between “John Doe #2” and Strassmeir); the 9/11 attacks. In turn, these incidents have operational links  with other terrorist incidents, such as the AMIA bombings. ENTIRE TEXT: The German show trial for the National Socialist Underground begins this week, after several false starts due to the Bavarian Court not wanting interested press at the hearings (see here). On 13 June 2001, Abdurrahim Özüdoğru was killed by two shots in the head with the same silenced CZ 83 already used in the murder of Enver Şimşek. Özüdoğru, who worked as a machinist for a big company in Nuremberg (which company?) had been helping out in a tailor’s shop; the murder was discovered by a passer-by who looked through the shop window and saw the body sitting in the back of the shop, covered in blood. On 27 June 2001 between 10:45 and 11:15 a.m, Süleyman Taşköprü, aged 31, died in his greengrocer’s shop in Hamburg-Bahrenfeld after being shot in the head three times. This was two weeks after the second murder, and the same guns as in the first case were used, a CZ 83 and a 6.35 mm gun. On 29 August 2001 Habil Kılıç became the fourth victim. Kılıç, aged 38, who was married and had a daughter, was shot at point-blank range in his greengrocer’s shop in Munich-Ramersdorf. This was the first of two murders in Munich. Are these linked to the 9/11 Hamburg cell? They all worked shop fronts, which are perfect for low level intelligence messengers, they may have been supplying something along the lines of fake ID/paperwork or weapons, or perhaps they were just messengers/couriers for German intelligence/ the Hamburg Cell Jihadis. The Hamburg Cell also frequented an extremist mosque in Munich. Once the 9/11 operation was underway, German intelligence cleaned house. The “NSU” vanished for 2 years just a little over a week before 9/11, with no more linked murders in that 2 year period. Repeat – the last murder was just over a week before 9/11, whilst one murder was Hamburg and one was Munich. If the NSU murders were normal far right extremists sending a message to asylum seekers, where’s the message? There was none. So, then two and a half years later in Rostock-Toitenwinkel, 25 February 2004, between 10:10 and 10:20, Mehmet Turgut was shot three times in the head and neck with a silenced CZ 83 and died instantaneously. Turgut, who had been living illegally in Hamburg, was in Rostock on a visit and had been asked by an acquaintance to open up a doner kebab shop that day. He was clearly targeted and enticed to be there that day and time. That is NOT a random far right killing. Because of Turgut’s link to Hamburg, Rostock police made the connection to the third victim, Süleyman Taşköprü, thus establishing the term doner murders. On 6 April 2006, just two days after the murder of Mehmet Kubaşık, Halit Yozgat became the last victim of the murder series. Yozgat, who ran an internet café in Kassel, Hesse, was also shot in the head with a silenced gun. On the occasion of this murder an agent of the Hessian Office for the BfV Protection of the Constitution was present. The agent claimed first to have left the premises shortly before the murder, but later changed his statement when presented with evidence of witnesses who had seen him present when the murder happened. His involvement with the case gave rise to suspicions that a German agency might be linked to the murders. When this BfV officer was investigated, various Nazi paraphernalia was present in his apartment, including some documents from the Third Reich, though it is not publicly known what these docs referred to. Is he really a Nazi, or is that being used to make out he is an extremist infiltrator of German intelligence – that he was linked to the murder through his Nazi affiliates, rather than being present at the murder BECAUSE he was working for German intelligence?? Either way, it looks an awful lot like these murders are German intelligence cleaning house, and the places and dates may suggest it is because the murder victims were involved in the organisation/recruitment/planning of 9/11 with the Hamburg Cell – knowingly or unknowingly (thinking they were doing their duty for German intelligence?). On 25 April 2007 Police officer Michèle Kiesewetter and her duty-partner were attacked during their lunch break. Kiesewetter was killed and her partner was critically wounded but survived with no memory of the attack (of course). While in the other cases the motive is assumed to be xenophobia and/or racism, it is unclear why Kiesewetter and her partner were attacked; theories include a variety of motives, such as a personal link between Kiesewetter and the alleged perpetrators who all came from Thuringia, or the acquisition of firearms. The duty-pistols of Kiesewetter and her partner were found on 4 November 2011 at the caravan where Böhnhardt and Mundlos were suicided, giving rise to the belief that this attack was linked to the NSU. Of course, its more likely that as the motive in the Police murder was not xenophobia, the previous murders were not either. In which case, did these cops stumble on something they shouldn’t have in a seemingly unrelated investigation? They had to be silenced. The whole way through, this has been covered up, until Beate is the last woman standing, with everyone else dead or suffering amnesia. This is classic house cleaning, and German intelligence have taken such a risk with it, that it can only be covering something massive – like the Hamburg Cell link back to German intelligence. Could these people have supplied evidence pointing at Germany being the hand behind 9/11?